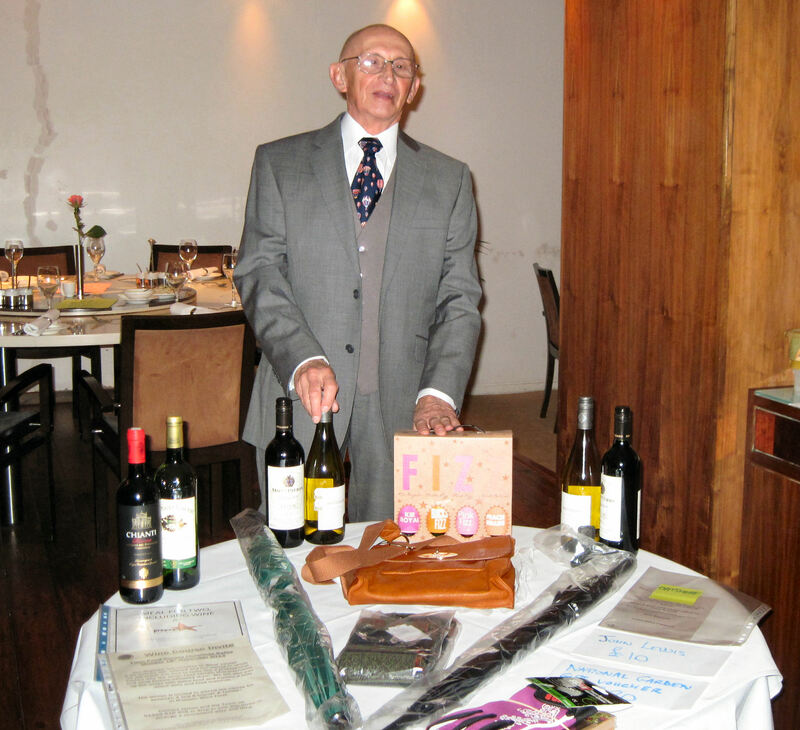 “What a great time we had at WE The Restaurant in Fleet on Monday 18 November. They hosted a fundraising dinner for Fleet Pond Society and what amazing food they served! We also had some brilliant prizes donated by local businesses for our raffle and Hart Ranger Louise Greenwood, Cllrs Sharyn Wheale and Sue Tilley and FPS Committee stalwart (and birthday girl) Mandy Saxby left no wallet unturned! 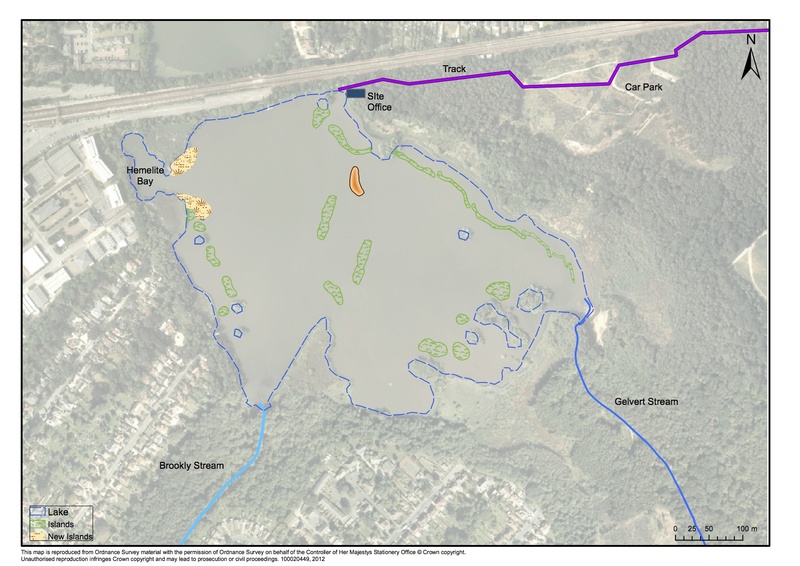 “The dredging equipment will soon return to Fleet Pond to begin the next phase of the ongoing Restoration Project. This phase is funded by the Environment Agency to help deliver ‘Water Framework Directive’ objectives and Natural England’s ‘Conservation & Enhancement Scheme’. This season’s main dredging work will take place in Hemelite Bay, the area nearest to the railway station. The resulting silt will be used to create extensions to the Wellington and Northern Reedbeds (marked on the map), which will then be planted up with reeds. Sediment will hopefully be taken offsite during this phase; we are awaiting lab results to help confirm where this might be. A sediment curtain will be installed in Brookly Bay to reduce the amount of silt washing down the Brookly Stream and entering the pond. This will contain the silt in a small area near the shore allowing future dredging to take place from the shore eliminating the need to carry out expensive in-lake dredging from pontoons. “This is an exciting time; the new islands have provided a great breeding habitat for birds at Fleet Pond and marshland plants and reeds have started to grow on the new islands”. 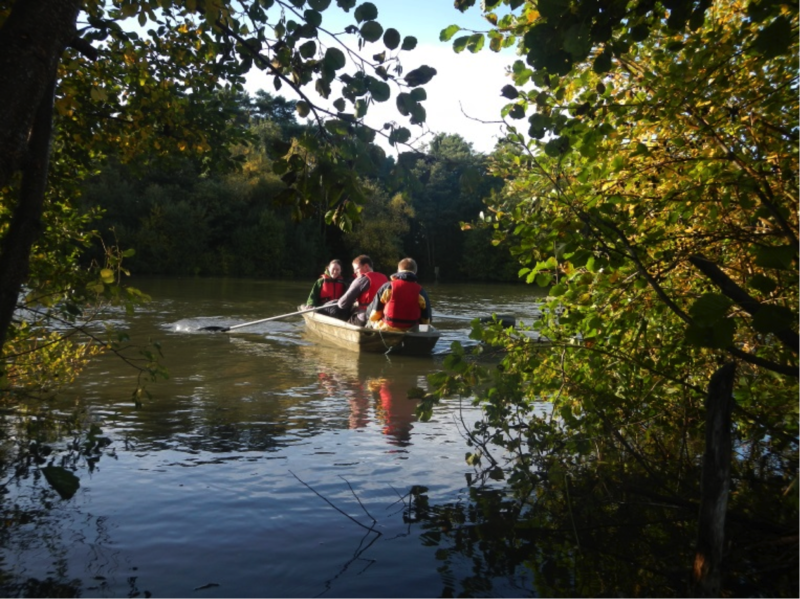 The Fleet Pond Restoration Project is an award winning, £1 million project to improve the water quality, led by Hart District Council in partnership with the Fleet Pond Society, Natural England, the Environment Agency & the Ministry of Defence. What Is The Local Area’s Top Attraction? There is a good overview of Fleet Pond Nature Reserve on the well-presented and useful Welcome to Fleet (and North East Hampshire) site. The video clip above is from the YouTube channel linked to the site. The above photos were taken with a mobile phone in the early evening, hence reduced quality but great that we have them! 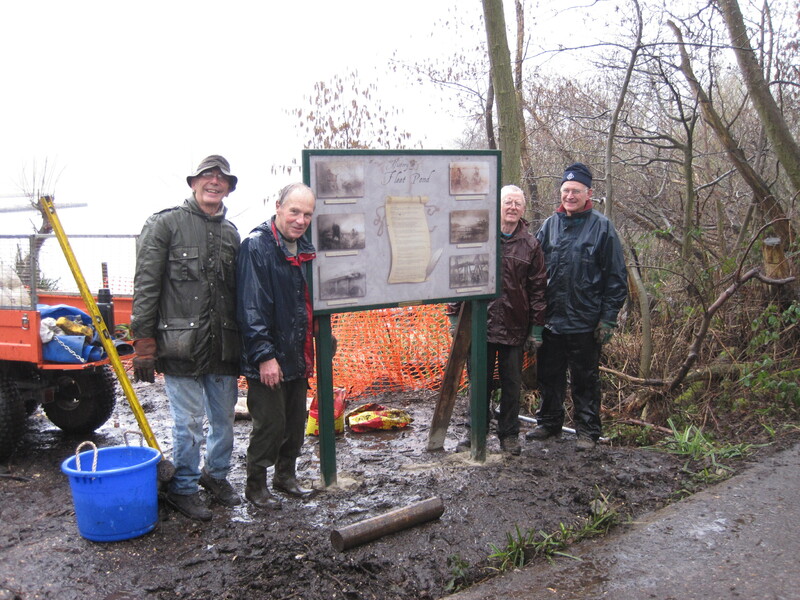 Earlier this year, Fleet Pond Society (FPS) received the Helen Deakin Environmental Award (see above, and also here for details). 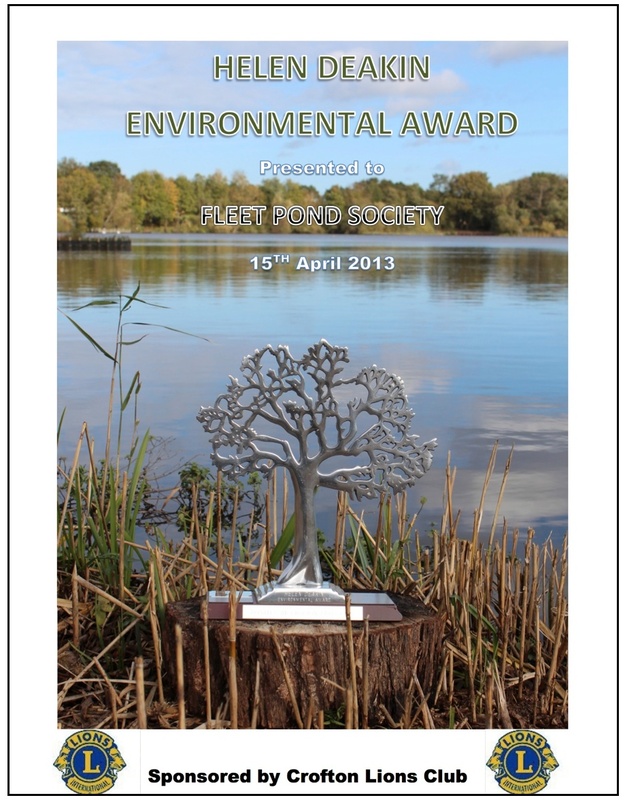 We’re delighted that FPS has regularly been recognised for its many contributions to improving the environment at Fleet Pond. Another (major) example is provided by the Fleet Pond Restoration Project which recently won the ‘Sustainability and Environmental Management Award‘ at the Institution of Civil Engineers Excellence Awards in June this year. 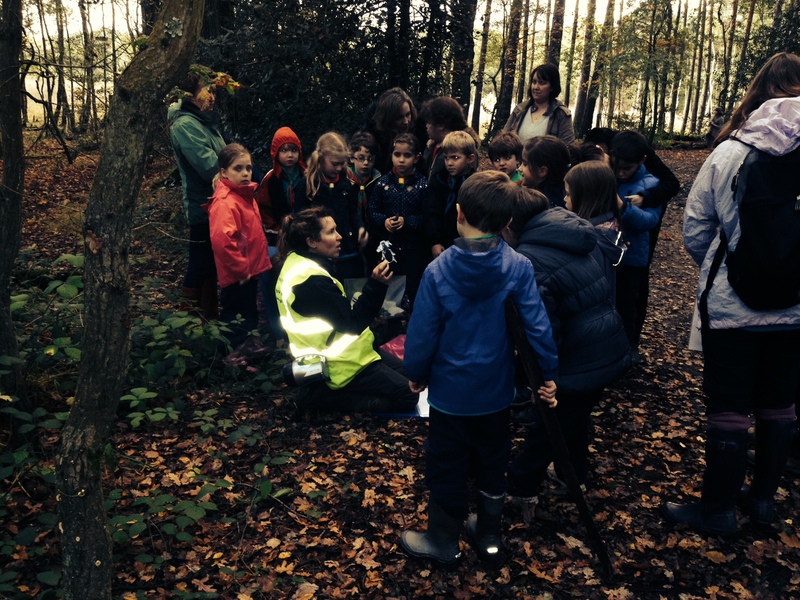 If you would like to support FPS in it’s conservation activities, why not become a member? See here for how to do this. 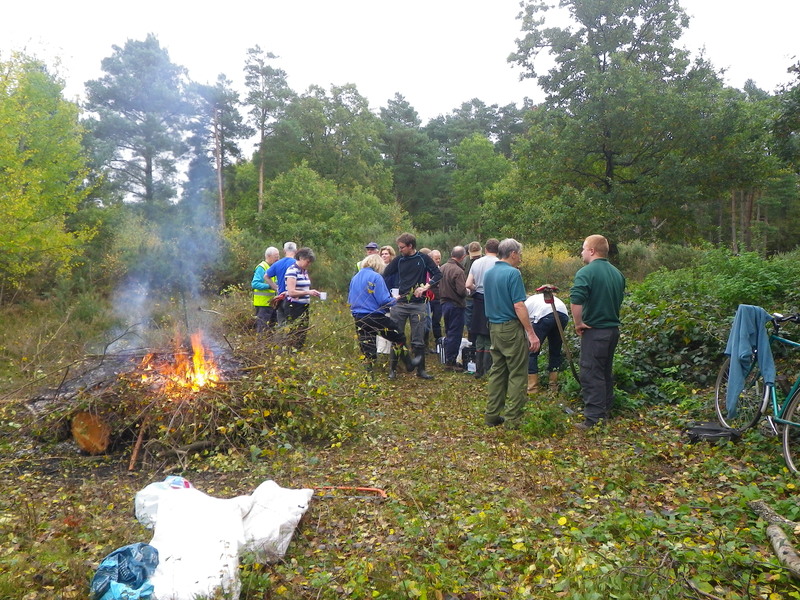 Independently of joining the Society, if you would like to help through taking part in a conservation task, either as an individual or as a team, please contact our Chairman, Colin Gray via phone 01252 616183 or email Colin Gray. 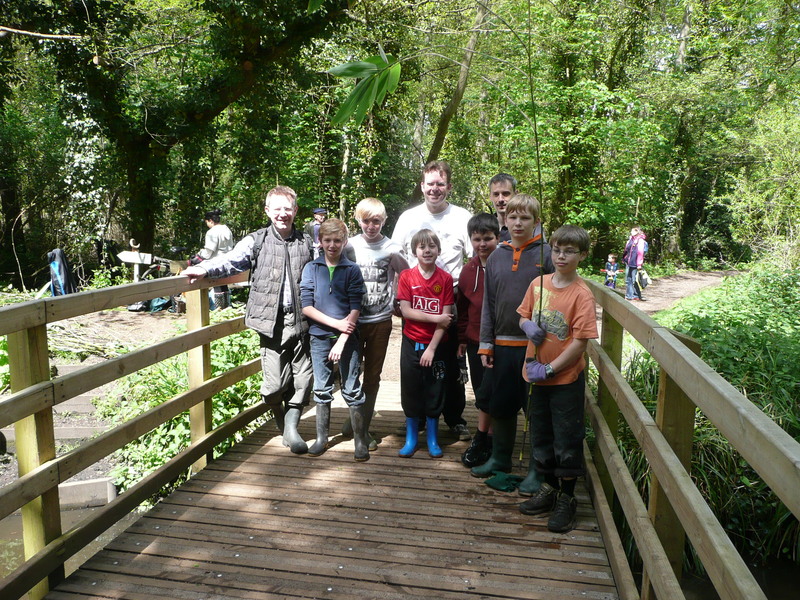 The Scouts were working towards their Community Challenge Award, which is one of the 7 challenge awards required to earn the Chief Scouts Gold Award (the highest award available to Scouts). FPS and Hart Countryside Services planned and managed the overall event and also took part. “On the Fugelmere Island, with Hart Ranger Rachel Jones, was the team called Hedgehogs. These are all graduates of Southampton University. All are now qualified and many work professionally in the field of environment education and training. 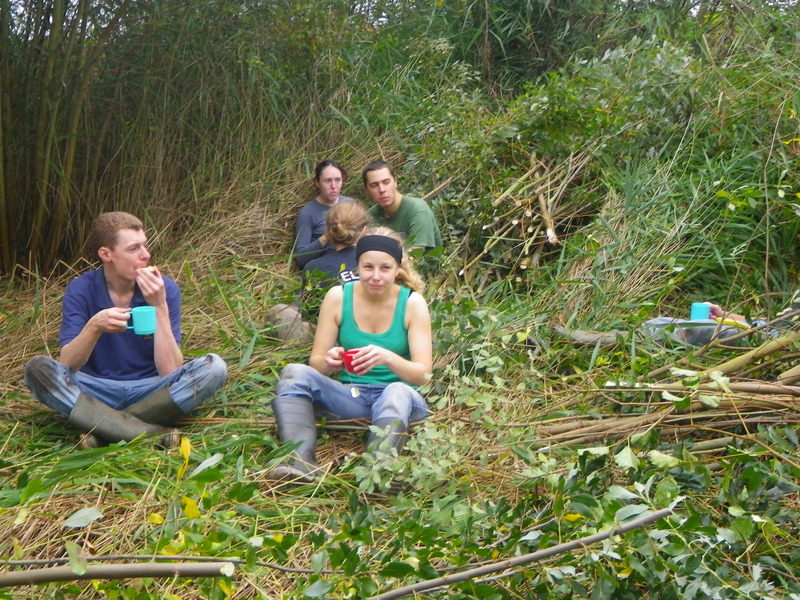 They started the Southampton University Conservation Volunteers visits to Fleet Pond while still at University back in 1998. 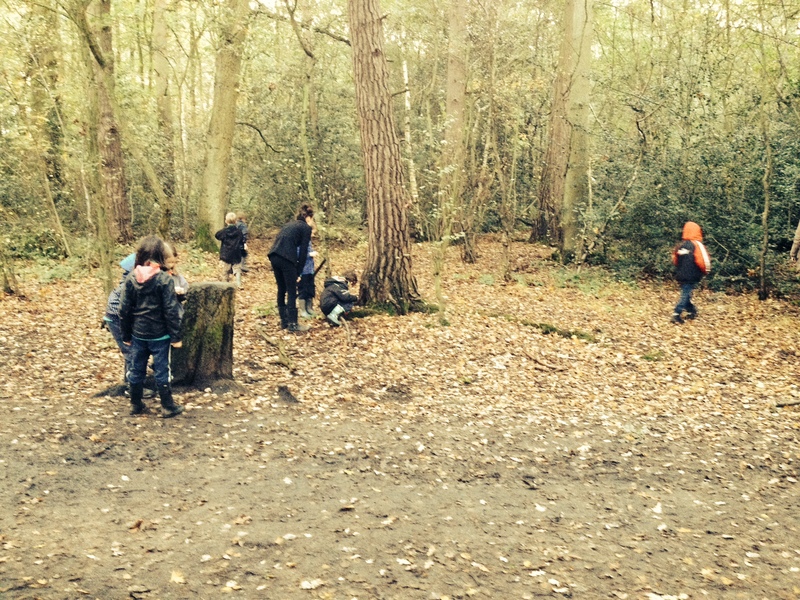 It was because of their love of Fleet Pond mud that we nicknamed them the Mudlarks (their former name). 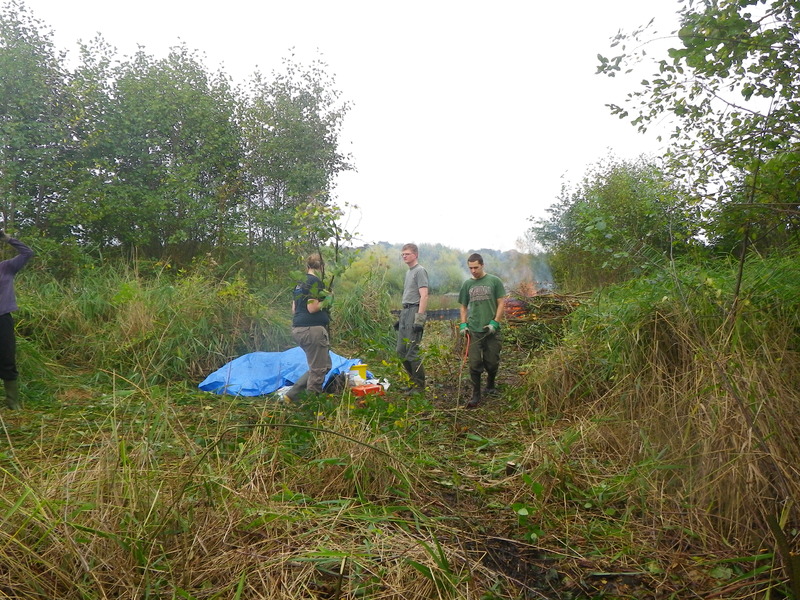 Working on Grasmere Marsh (near Chestnut Grove), with Colin Gray of FPS, was the team of students at Southampton University who currently form Southampton University Conservation Volunteers. This was the first time that this group had visited the pond and, because access by train is very convenient for them, we are likely to see them again. The locations mentioned can be found on the map in the About page. Please note that the map is not totally up to date, see here for a picture with the new islands! 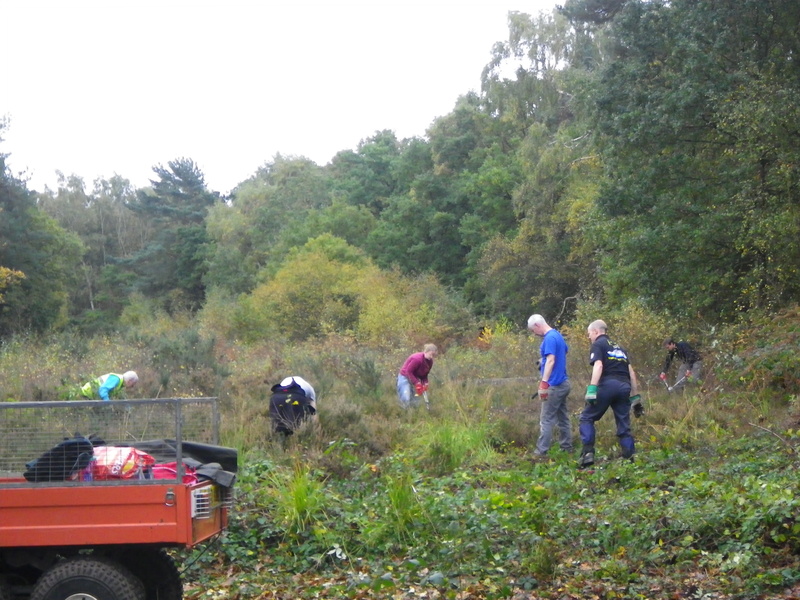 “A bright sunny Saturday in October saw the return of the Hedgehogs (the graduated Southampton University conservation volunteers) to Fleet Pond for their annual work party. After meeting at the workshop and having the normal safety talks, we headed out in the two boats over to Fugelmere island. 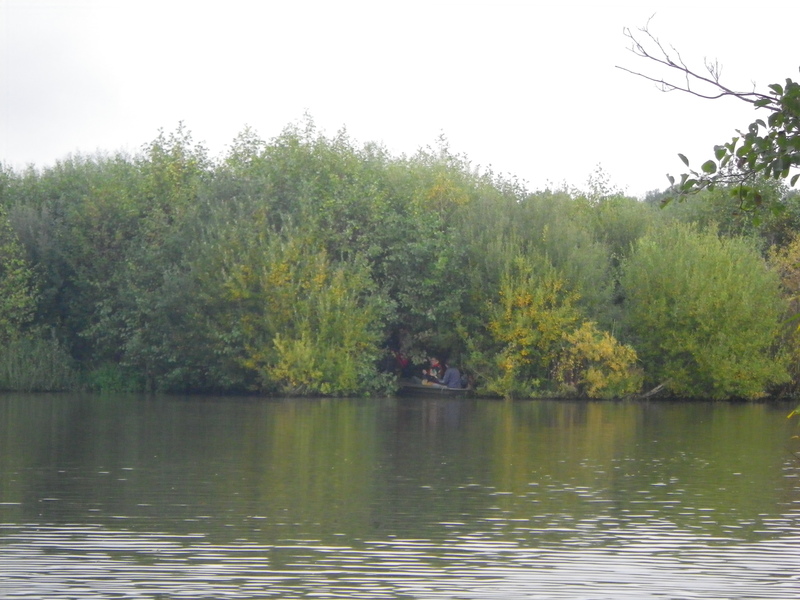 Many of the volunteers had been out to Fugelmere 6 years ago so it was interesting to see how the alder and willow had recolonised the island. After getting the 12 of us over to the island it did not take long to get a fire going and to clear a nice large area around the fire. The fire plays an integral part of our work as it provides us a means to cook the jacket potatoes and roast marshmallows at the end of the day! We cleared a large area on the Saturday and our hopes were high to finish the island completely on the Sunday. On the Sunday morning the weather wasn’t as bad as had been forecasted with only a couple of short showers – nothing to put us off our stride. Just after lunch though the thunderstorms arrived and we had some very drowned looking volunteers scurrying around the island trying to cut things down and keep the fire fed. To our credit we kept going in the deluge until we came to a group decision that the rain wasn’t going to stop and although it wasn’t impacting the fire we were all soaked to the skin. So we packed up and turned in the fire, to head back across the lake to the depot. 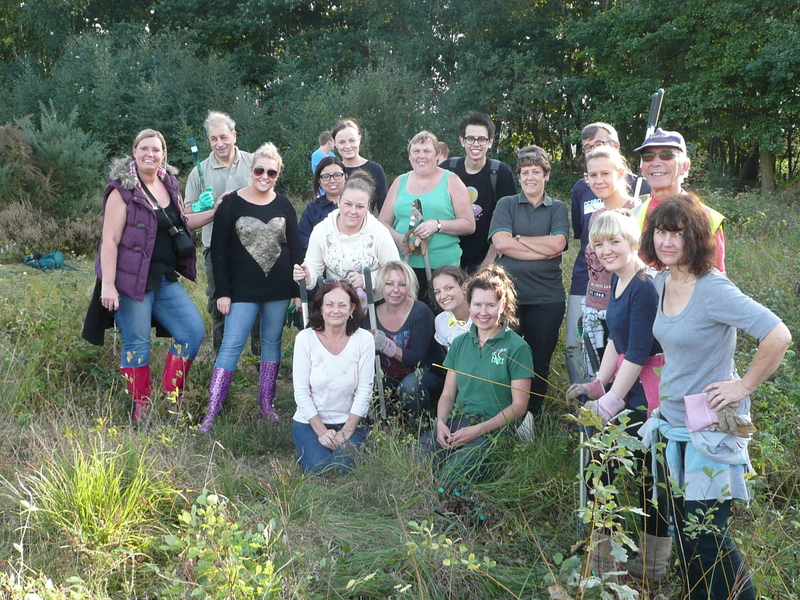 FPS and Hart Countryside Services are very grateful for all the hard work carried out by the two teams and we hope to see them at the Pond again. 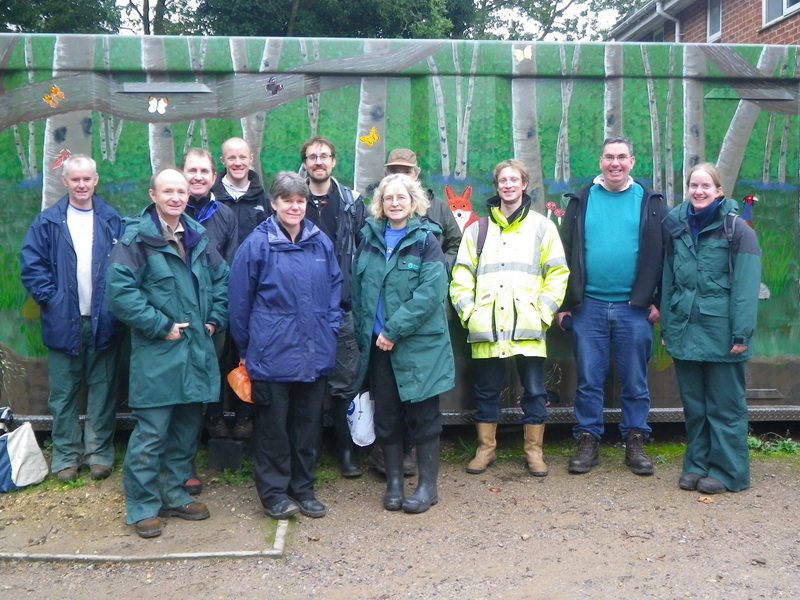 On Friday November 1st, a team from EA took part in a volunteer event at at Fleet Pond. They were accompanied by Hart Countryside Rangers Will and Rachel, together with some of the FPS LOSW crew; Geoff, Nick and Terry. The photos below give a good flavour of the day. As you can imagine, a lot got done – very satisfying for all concerned! We’re very grateful for all the hard work that the EA team put in. As part of the day, Terry Austin gave a walk-and-talk on the fascinating history of Fleet Pond (there’s more to it than you might think). Fleet Pond Society (FPS) have produced an attractive booklet on this topic, with impressive artwork from a local freelance illustrator, Andy Johnson. This booklet is available as a free pdf download here. Why not take a read? 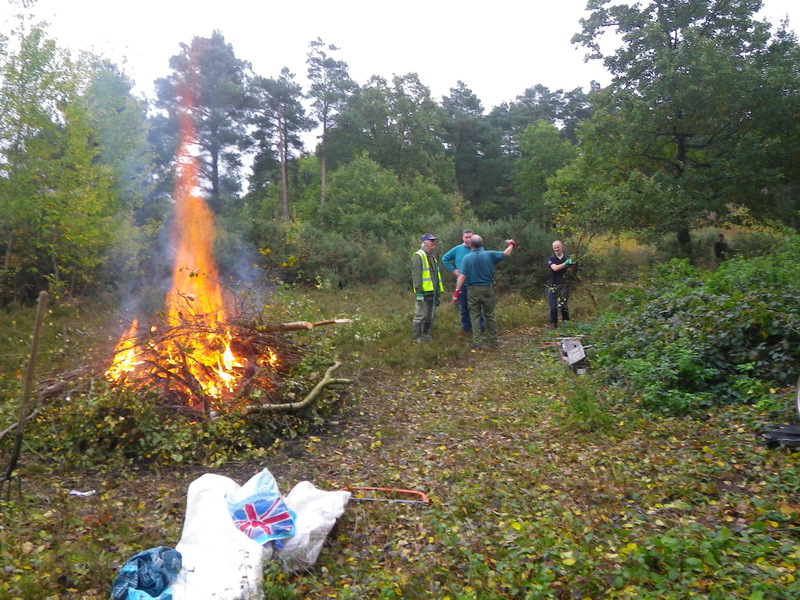 Clearing the birch off the heath at Fleet Pond. Ranger Will did a great job treating any cut stumps. Time for a well-earned cup of tea and chat! You are currently browsing the Fleet Pond Blog blog archives for November, 2013.